Full Name: Neikan Chi (根井カン血). Meaning of Name: Wicked Blood. Type of Build/Body: Well toned. Skills:Due to his vampiric nature, Neikan also possesses some physical attributes other than the unnaturally pale skin; such as, fang like teeth, both on the top and bottom of his mouth, and claw like fingernails. He also possesses several heightened senses such as smell, hearing, sight..even taste, touch, speed..strength. Neikan also has an interesting ability. He can control and change a persons emotions. He has such great control over it, that he can do it without anyone ever noticing it. Another interesting aspect about Neikan is that he can change his 'human' form into that of a wolf. Many call him a vampwolf; Half wolf, and half vampire. That, however, isn't the case. Shape shifting just happens to be a power of his. Attitude/Personality: Neikan is a natural born rebel and shows it at almost all times. 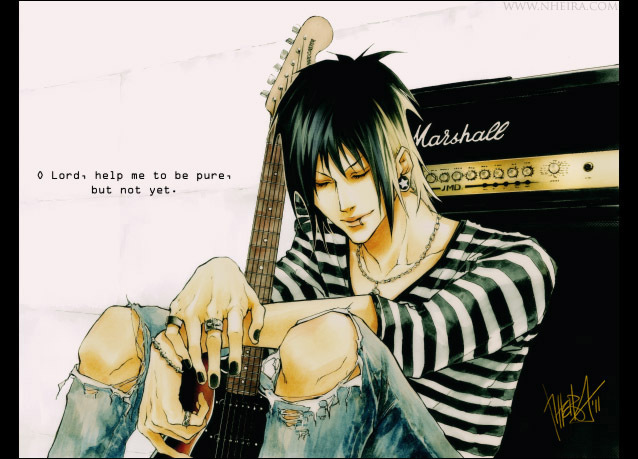 He is lead vocalist for the visual kei band, Hopeless Beauty and often shows that he is more than simply a pretty face. He loves to sing, but thanks to his being a vampire, he can only become famous in the underground music industry. When on stage, he can often times be seen doing what society considers to be naughty and rude. Of course, that is more for the fans than for himself. He's 100% gay and has no intention of ever considering dating a human female or any female for that matter. Neikan can also be considered to be a sadist and masochist. He both loves to cause pain for those he loves and for those he loves to cause him pain. He can often times come off as rude and dark. He tends to hurt people's feelings on accident and doesn't notice that he does it unless told that he did. He also seems childish at times and has a dark, but sweet charm about him. 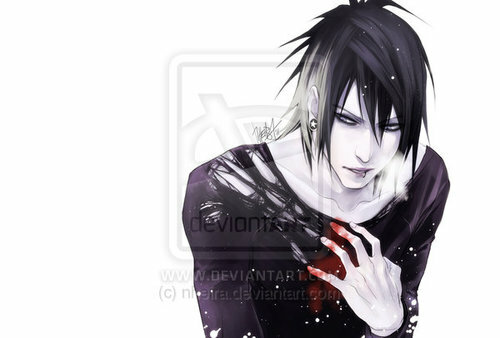 Neikan, like most vampires, goes for human blood, but prefers to only drink from human males. Though his eyes never change color when he's thirsty, he does become more animistic and violent. Neikan, more goth than anything, is usually silent yet sly and perverted in almost any way possible. He's extremely talented in both singing and drawing. He love anime so he often draws anime in his sketch book and has a love and connection with all canines, even wolves. He can seem innocent and beautiful when he's doing what he loves. His art and singing are his most prized achievements in his undead life. He can also seem to be egotistic and a jerk at times thanks to his still present, despite him being gay, male pride. Talents: Singing, playing the guitar. History: Neikan's past with Admin/Site owner ((Kira's)) approval will be developed during game play.